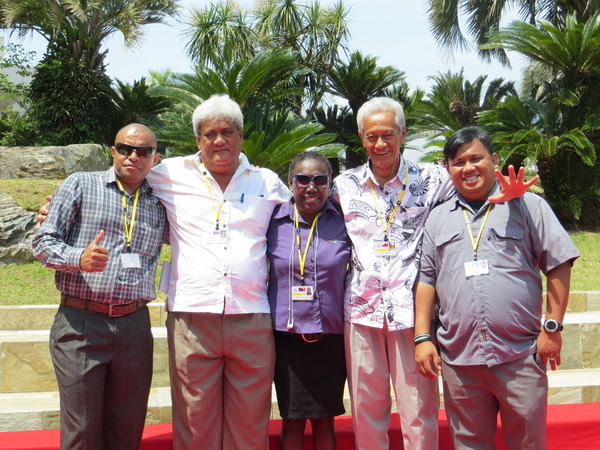 Journalists from five Pacific island countries visited Japan from 17th to 26th May, 2015 with the invitation by the Sasakawa Peace Foundation. This program was organized for the time of the 7th Pacific Islands Leaders Meeting (PALM7) held on 22nd and 23rd May, 2015 in Iwaki-city, Fukushima prefecture. With cooperation of the Ministry of Foreign Affairs and Foreign Press Center Japan, the Sasakawa Peace Foundation provided the invited journalists opportunities to cover various topics on relationship between Japan and Pacific island countries. While in Japan, the five journalists covered not only the PALM7 summit meeting, but also many PALM related events such as a tea party at Imperial Palace, Pacific Festa 2015, PALM Trade and Investment Promotion Forum, and Climate Change and Development Forum. The journalists also covered reconstruction efforts in Tohoku region affected by 2011 Great East Japan Earthquake and tsunami while attending the Reconstruction Agency's briefing session on their reconstruction program and listening to local residents in Iwaki City. Visits to Japanese media organizations such as nippon.com and Sankei Shimbun were organized beside the PALM7 coverage. The journalists from the Pacific island countries that consist of a number of remote islands were interested especially in generating information through the internet. They eagerly exchanged views and ideas on online news delivery with media experts of those Japanese organizations. The invited journalists also visited Tokyo Skytree and Asakusa Sensoji Temple where they witnessed Japanese technology and culture.